It had been a dreamy Sunday. The sun had reappeared after a few weeks of stormy and unpredictable weather. There were but a few wispy clouds in the sky as we headed for Puig de Maria, an old monastery on the top of a very big hill. The views at the summit were apparently stunning, and after the tough hours walk we all confirmed that they were. 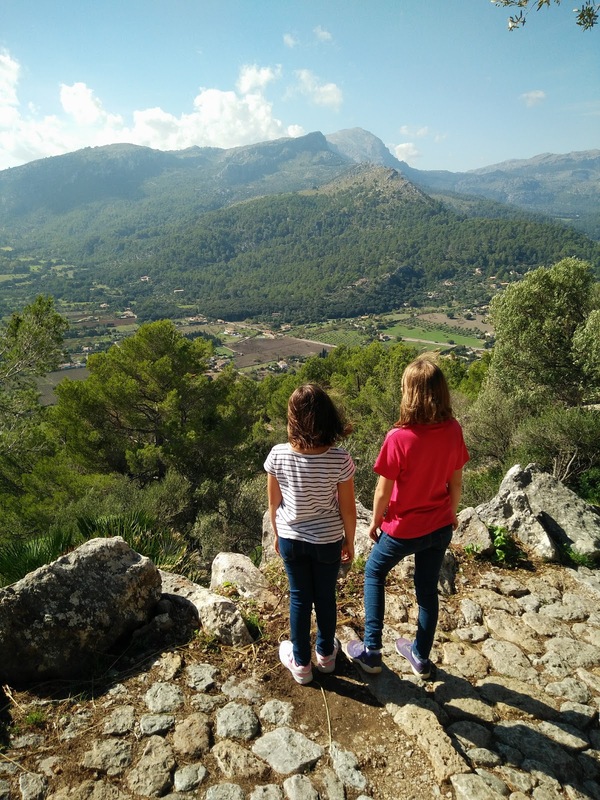 The vista across to the Tramuntana was tempting, luring us for winter hiking and discoveries. The towns below had shrunk to Playmobil size and the blue of the coast as inviting as ever. It really was a breathtaking walk. We were all feeling so happy, so content with life, so exercised, so healthy and looking forward to our meal in Pollenca as we descended the hill. Only to be greeted with a parking fine, to be fair we had parked on a grassy kerb but so had everyone else - yes, they all received a fine as well. Darn. 80 flipping euros up the spout. Upon looking at the fine it seems there was an option to pay 40 euros, I guess if we paid it quickily. Our Spanish could not work out how and when to pay so I asked a lady in a shop. She shrugged her shoulders, I don't know she said, after reading all the 'terms and conditions' of the fine. I will call my friend she said, and then proceeded to write a telephone number of the hacienda for us. Maybe they will help you she said. A Spanish person couldn't work out how to pay the 40 euro option, so we had lunch and thought about our dilemma. "Oh you have una multa!" the waiter laughed at us, in perfect clipped English. I explained our predicament. He read the back of the fine and couldn't tell us how to pay it either. "Go to the police station after your lunch - you can pay it there, I don't know if it is 80 euros or 40 euros!" he shrugged again. "I had a fine last week, in Palma, much more money than yours for the drinking and the driving you know?!" he grinned and gestured the international sign for drinking booze with his thumb and little finger. "But I pay it the next day, 50% less, at the police station, " he explained.